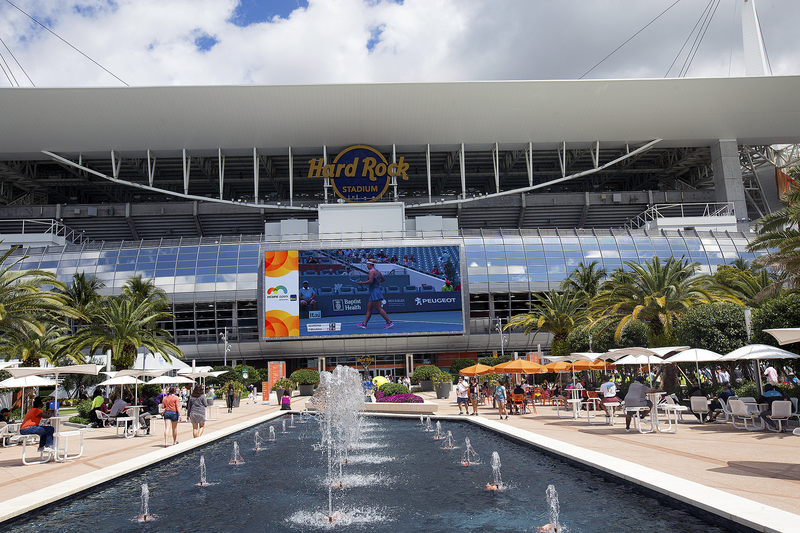 MIAMI — Less than a year before it becomes the center of the universe on Feb. 2, 2020 for the Super Bowl, Hard Rock Stadium hosted the biggest stars in tennis for the Miami Open. 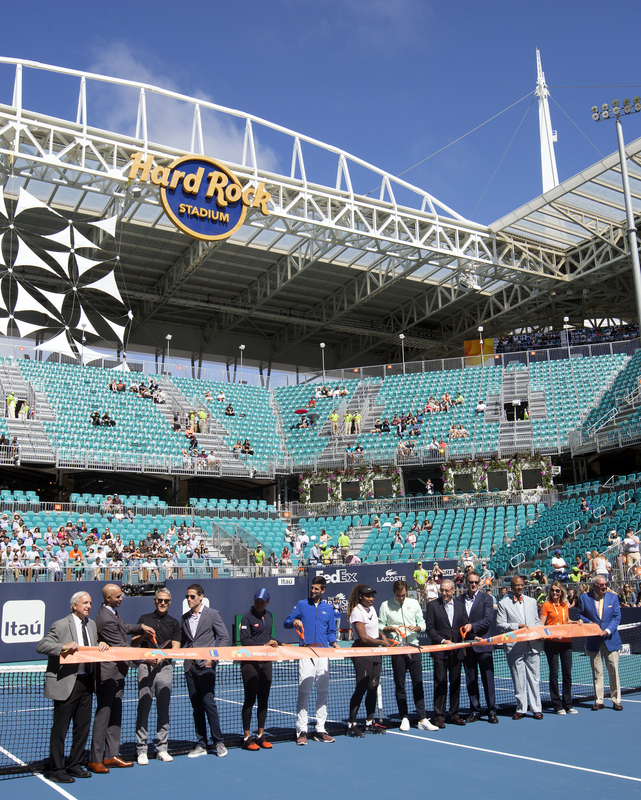 Serena Williams, Roger Federer and Novak Djokovic – winners of a combined 58 Grand Slam titles – gathered March 20 at the 14,000-seat stadium court inside Hard Rock Stadium for the opening ceremony of the tournament, which is in its first year in Miami Gardens after being played for the past three decades in Key Biscayne. They cut the ribbon alongside Naomi Osaka, the No. 1 ranked women’s player in the world, tournament officials, local elected officials, Dolphins and stadium owner Stephen Ross and Tom Garfinkel, the team’s vice chairman, president and CEO. 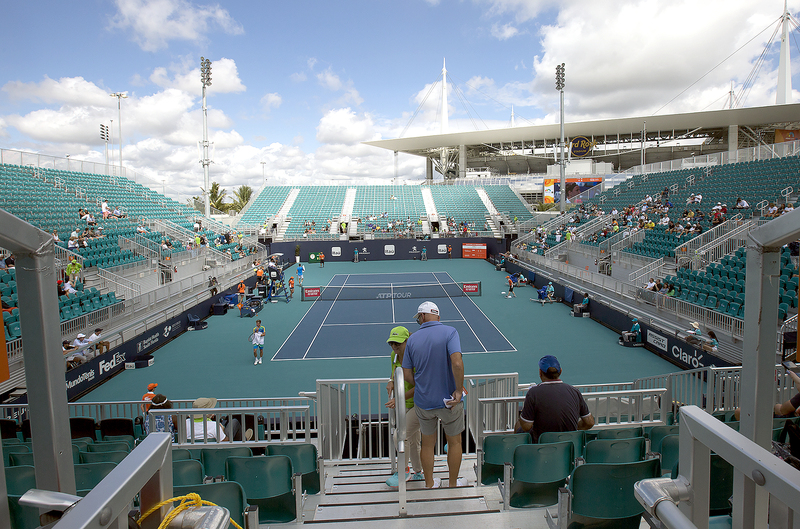 The temporary stadium court was built on a portion of the football field and featured some of the marquee matches while outside nearly 30 new courts comprise the tennis facility in an area that previously was used for parking. The stadium within the stadium drew rave reviews. “Now that we’re here in this new stadium, it’s super amazing,” Williams told the tennis fans and media. Positive sentiments about the setup and experience were echoed throughout the field. 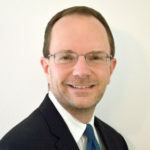 In August 2016, the Dolphins and Hard Rock International, which is owned by the Seminole Tribe of Florida, announced an 18-year naming rights agreement for the stadium, whose upcoming menu also includes the Rolling Stones on April 20 and college football’s national championship game in 2021. Williams, who has won the tournament eight times, didn’t make it past the first weekend. Citing a left knee injury, she withdrew after playing just one match, but the sudden exit didn’t lessen her impression of the new setup. “It was an amazing experience to play at the Hard Rock Stadium this year and would like to thank the Miami Open for putting on an amazing event. 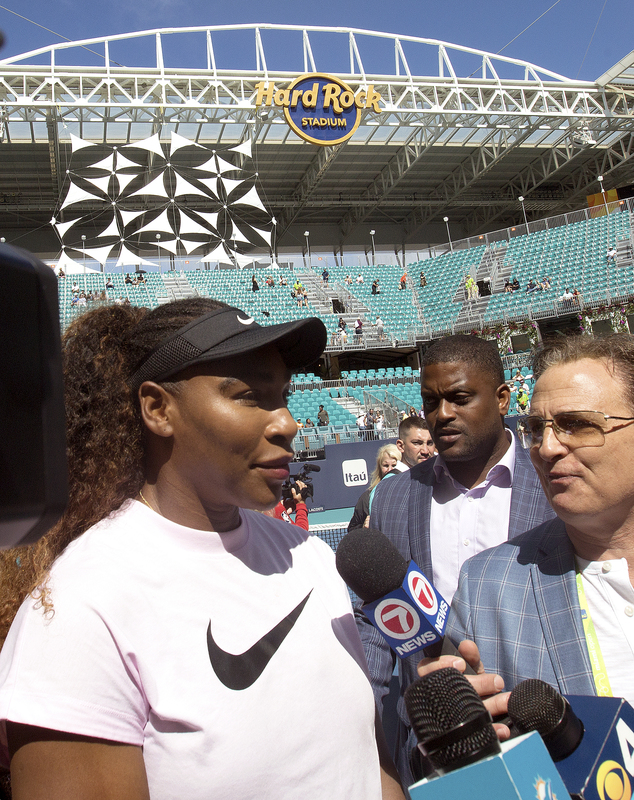 I hope to be back next year to play at this one-of-a-kind tournament in front of the incredible fans here in Miami,” Williams said in a statement.